Mohan Bhagwat has voiced his strong opinion on the same issues the Sena had been raising, the party said, adding that this could be a ray of hope given the situation in the country. Mumbai: The Shiv Sena on Monday wondered if RSS chief Mohan Bhagwat would be branded "anti-national" or "anti-Hindu" for his comment that the country needed a protest against corruption. The 'sarsanghchalak' has voiced his strong opinion on the same issues the Sena had been raising, the party said, adding that this could be a ray of hope given the situation in the country. "RSS Sarsanghchalak Mohan Bhagwat pointed out that the administration has become weak and there is countrywide corruption. Because he admitted to corruption (in the country), will he be stamped as anti-national and anti-Hindu?" the Sena asked in an editorial in its party mouthpiece 'Saamana'. The Sena was the first to speak on corruption and now Mr Bhagwat has raised the same issues, it said. Invoking warrior king Shivaji's rule, Mr Bhagwat last week asked who should be blamed for the changed times, where a woman's safety is not guaranteed, and said India needed a protest against corruption. He was addressing a gathering to mark the death anniversary of the 17th century Maratha king in Raigad district. "The country has always taken seriously the stands of Shiv Sena supremo late Balasaheb Thackeray and the heads of the Rashtriya Swayamsevak Sangh (RSS). These two top leaders never contested any polls but they strengthened the right-wing organisations working for people's causes," the Shiv Sena said. Mr Bhagwat, it said, has posed the difficult question of frequent protests against corruption by social organisations and political parties. Opposition parties, it remarked, had stalled the functioning of Parliament over the same reasons. "Though there is a BJP-led government at the Centre, the actual control is in Nagpur (implying the RSS headquarters). And now, the RSS chief himself has raised the uncomfortable issues," it said. Some BJP leaders wondered about the Shiv Sena criticising the Central and Maharashtra governments despite it being a part of the ruling dispensation. They even wonder whether the Sena has lost its balance, quipped the Uddhav Thackeray-led party. The Shiv Sena, the editorial said, welcomed Mr Bhagwat's appeal of setting aside castes and its tensions. The Sena also pointed to violence in West Bengal after sword-wielding BJP supporters allegedly defied that state government's ban on armed rallies on Ram Navami. In this context, the "RSS chief could be disappointed with the non-construction of the Ram temple in Ayodhya", the editorial said. The Sena also raised issues related to inflation and the education system. Sadly, the CBSE exam paper leaks are now linked to an alleged leader of the Akhil Bharatiya Vidyarthi Parishad (ABVP), the student wing of the RSS, it said. 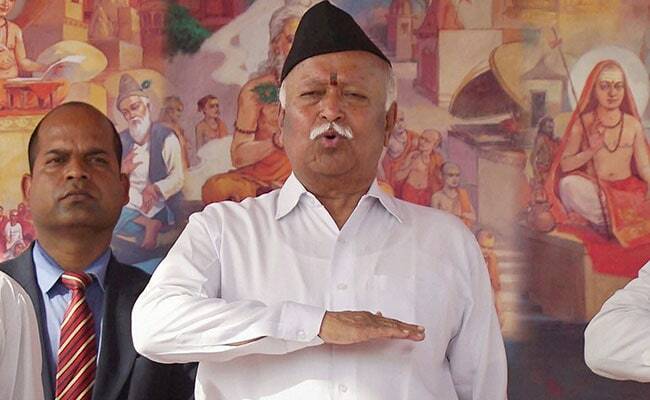 Mr Bhagwat's comments could prove to be a ray of hope against this backdrop, it added.